PYEONGCHANG, Gangwon Province -- Tensions are easing on the Korean Peninsula, a region where the wounds of war still remain. With the second summit between US President Donald Trump and North Korean leader Kim Jong-un set to take place within a couple of weeks, hopes are high that their meeting will be a meaningful step toward peace on the peninsula. One of the most crucial tasks the two leaders should focus on at the upcoming summit is drawing up a peace treaty to bring a formal end to the 1950-1953 Korean War, said Lisa Pelletti Clark, a co-president of the International Peace Bureau and vice president of the Italian peace and disarmament NGO Beati i Costruttori di Pace (Blessed Peace Builders). “(Drafting) a peace treaty and ending the war (on the Korean Peninsula) is the first thing that should be done,” Clark said in an interview with The Korea Herald on Feb. 9 in Pyeongchang, Gangwon Province. 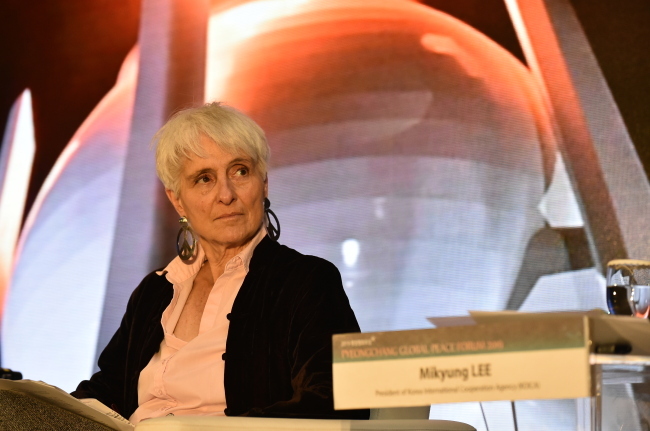 The peace activist was in South Korea to attend the PyeongChang Global Peace Forum, which took place Saturday through Monday. The Korean Peninsula was divided in half following the end of World War II and the two Koreas are have been in a cease-fire since the Korean Armistice Agreement was signed in 1953. Over the decades, the inter-Korean relationship has seen rough times, with provocations by the North that included missile and nuclear tests. But following the inauguration in May 2017 of President Moon Jae-in, who promotes engagement with the North, a series of historic summits have taken place between the leaders of the two Koreas and between the US and North Korea. Hostilities with the communist regime have eased off for now as a result, and the possibility of a peace treaty is one of the topics under discussion. “While the two leaders (Trump and Kim) are not ‘peace-loving’ people, they surprise us with the gestures that go in the direction of peace, which calls for optimism,” Clark said. Clark was elected as co-president of the Nobel Peace Laureate organization IPB in 2016. Reiner Braun, its other co-president, was elected in 2013. Dedicated to a world without war, the group mainly focuses on peace education, promoting disarmament and reallocating military expenditures for other purposes. While the US and North Korea both demand reciprocal steps -- with the North insisting on sanctions relief and the US on concrete steps from the North toward denuclearization -- Clark criticized the economic sanctions imposed against the North, saying that was not the way to negotiate for peace. “There must be an openness in dealing with negotiations. ‘You have to do this first and then I’ll do the other’ -- that can never be for peace. If the ‘other’ is a just thing to do, I believe they should just go ahead and do it." Clark added that she does not believe any group of people is inherently wicked, and that there are probably quite a number of North Koreans who favor reunification. Having witnessed the Yugoslav Wars, which took place from 1991 to 2001 and broke up the Yugoslavian state, Clark could not understand how a country she loved could descend into such hostilities. “I could not believe that the people who had been living together for some 40 years were all of a sudden killing each other. So I went, to try to figure out,” Clark said. There, she began to organize peace marches into the war areas in Yugoslavia. Clark started such campaigns in her late 30s and took part in peace activism in many of the war zones. While living in Sarajevo when the city was under siege, she supported nonviolent groups in Bosnia and Kosovo. She has also promoted human rights and election-monitoring missions in Palestine, Albania and the Mexican state Chiapas. As a professional interpreter of French, Italian and English, Clark has accompanied institutional missions to Eritrea, Ethiopia, Algeria, Somalia and Kenya. In 2007-2008, she coordinated the Italian campaign “For a Future Without Nuclear Weapons,” which submitted draft legislation to the Italian Parliament aimed at declaring Italy a nuclear weapons-free state. As an activist who focuses much of her work on nuclear disarmament, Clark also expressed disappointment over the recent US withdrawal from the Intermediate Range Nuclear Forces Treaty. The landmark arms control treaty was signed between the US and the former Soviet Union in December 1987 and eliminated the two countries’ intermediate-range and shorter-range missiles. Though it did not cover air- or sea-launched weapons, the treaty effectively prohibited ground-launched ballistic missiles and cruise missiles with ranges of 500 kilometers to 5,500 kilometers. Citing Russia’s noncompliance, however, the US announced its official withdrawal from the treaty via a statement issued Feb. 2 by Secretary of State Mike Pompeo. Following the announcement, Russian President Vladimir Putin also withdrew Russia from the treaty, which is likely to come to an end around August, but Clark still hopes the US and Russia will reconsider. The IPB is also working to persuade European countries to adopt the Treaty on the Prohibition of Nuclear Weapons. Having witnessed so much violence and hostility in conflict-torn regions, she stressed the importance of human warmth. “Peace includes all sorts of conditions of life. When somebody is exploited at work, or oppressed because they are a minority, that’s not peace -- even if there is no war and no one’s killed,” Clark said. Clark also highlighted the importance of peace education for future generations, especially the role of women in achieving a more peaceful world. “For the enormous work, my conviction, and I am sorry to say this, is that women are better at it than men. And it is because we have taught boys wrong, that it is a ‘manly’ thing to reply with force,” she said, adding that the way children are nurtured needs to change. IPB has 300 member organizations in 70 countries, and 13 of its individual and group members are Nobel Peace Prize laureates.